Corinth, a town and important rail junction in Northeast Mississippi, was the scene of much military activity during the Civil War, including a siege in the spring of 1862 following the Battle of Shiloh and a bloody battle in October of the same year. The latter engagement resulted in more than seven thousand casualties and a Confederate repulse, leaving northern Mississippi largely in Union hands. The Mobile and Ohio and the Memphis and Charleston Railroads, which intersected at Corinth, were constructed during the 1850s. The rail lines made the small town a strategic location during the opening years of the Civil War. After Shiloh, Confederate forces under P. G. T. Beauregard defended Corinth against the slow-moving Union forces of Henry W. Halleck, who eventually occupied the town in late May 1862. 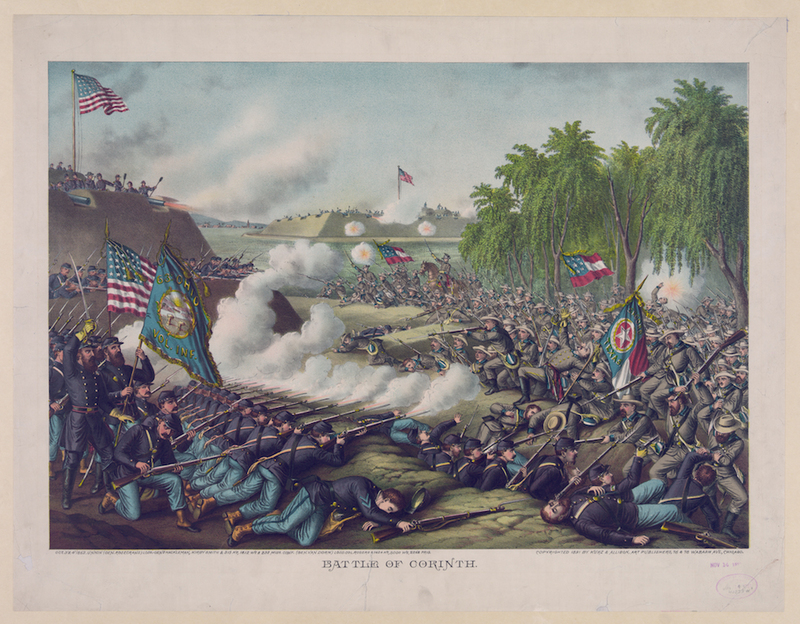 In the fall of 1862 Corinth again became the target of military operations as the Confederacy launched a strike into Northeast Mississippi as part of a larger offensive that also included Robert E. Lee’s invasion of Maryland and Braxton Bragg’s and Edmund Kirby Smith’s movement into Kentucky. In Mississippi, small southern armies under Sterling Price and Earl Van Dorn focused first on Iuka and ultimately Corinth. On 14 September, Price’s Army of the West, in an effort to prevent Union troops from reinforcing those opposing Bragg in Tennessee, occupied Iuka, which had been evacuated by Federal forces under William S. Rosecrans. Ulysses S. Grant quickly ordered Rosecrans and Edward Ord to retake the town and drive off Price. On 19 September a spirited engagement between Rosecrans and Price took place near Iuka, after which Price withdrew from the town. In the aftermath of the fighting at Iuka, Price met with Earl Van Dorn, commander of a separate small Confederate force operating in northern Mississippi, and discussed a joint attack on either Bolivar, Tennessee, or Corinth. The two generals settled on Corinth, believing that Rosecrans, who had moved his forces to that location, was vulnerable to attack. The Confederates would make a feint against Bolivar before moving their combined force of twenty-two thousand, commanded by Van Dorn and now called the Army of West Tennessee, against Corinth. Rosecrans strengthened three lines of inner and outer defensive works, one of which had been constructed by Confederate troops during their earlier defense of the town. This outer line, known as the Beauregard Line, was located about 2.5 miles north of the town, while a shorter group of artillery positions called the Halleck Line had been erected 1 mile closer to Corinth. Finally, the Federals constructed the College Hill Line of five artillery batteries and supporting earthworks closest to the town. The Union general positioned his twenty-three-thousand-man force, organized into four divisions, under generals Thomas McKean, Thomas Davies, Charles Hamilton, and David Stanley. On 29–30 September Van Dorn’s forces moved northward from Ripley toward Pocahontas, Tennessee; they then turned eastward to Chewalla before marching southeast toward Corinth. On the morning of 3 October they launched their initial assault against the town’s outer defenses. One of Van Dorn’s divisions, commanded by Mansfield Lovell, took its position on the Confederate right, while Price’s forces under Dabney Maury and Louis Hebert occupied the left. During the first day’s fighting the Federals conducted a fighting withdrawal southward toward Corinth and the protection of the College Hill Line. In particular, Davies’s division inflicted heavy casualties on the attackers, though the Rebels ultimately captured the Union position at the White House. By late afternoon the Southern forces were threatening the last Union line, but Van Dorn and Price delayed a final assault until the following morning. Before dawn on 4 October, Confederate artillery began bombarding the Union-held town, with Federal cannons soon responding. The Confederate left, now commanded by Gen. Martin Green after Hebert had gone down with an illness, assaulted and captured Battery Powell, driving the exhausted Union defenders back into the streets of Corinth, with heavy fighting taking place near the railroad junction and the Tishomingo Hotel. Despite being reinforced by a brigade from Maury’s division, Green’s troops eventually fell victim to Union infantry and artillery fire and withdrew. While the defenders fought to stop Green’s advance, they also faced an assault by the remainder of Maury’s division, which focused on Battery Robinett, one of the main positions of the College Hill Line held by Union troops under Stanley. Despite heavy musket and artillery fire, elements of John Moore’s Confederate Brigade, especially the 42nd Alabama, the 35th Mississippi, and the 2nd Texas, managed to reach the battery and briefly occupy part of it until a counterattack killed or captured most of those Confederates who had advanced that far. Col. William P. Rogers of the 2nd Texas fell dead while leading a small group of his men in the vanguard of the attack. The failure to hold Robinett ended the major fighting, and Van Dorn quickly determined to withdraw. Lovell’s division, which had not become engaged in the second day’s fighting, covered the Confederate retreat. Southern casualties in the two-day battle numbered 4,838, including 505 killed. The Federals had 2,520 casualties, including 355 dead. In the battle’s aftermath, Grant, the area commander, moved to consolidate various forces in an unsuccessful effort to pursue Van Dorn’s defeated army. Van Dorn was relieved of his command and replaced by John C. Pemberton. Criticism of Van Dorn’s leadership during the campaign led him to ask for a court of inquiry, which eventually found him innocent of all charges. Corinth remained in Union hands for the rest of the war, though the region was the scene of a number of skirmishes and other military activity.